Refine your talents, find your creative voice and grow confident in becoming the illustrator you want to be. "I did my first degree at the University of Gloucestershire and I liked the atmosphere, the campus and the tutors so much that I decided to stay for my MA. The tutors are really easy to talk to and are always there to help. I also really enjoy the comradery between students - there's always someone willing to help or to talk things through with, which helps with generating ideas. This course really helps you find your voice when it comes to illustration. I currently work freelance for the Bright Children's Illustration Agency and I have a book coming out later this year called 'The Lost Diary of Sami Star'. The course has been key in helping me to develop my portfolio and secure clients." Unique opportunities to showcase your work. Enter the Cheltenham Illustration Awards and showcase your work alongside the best illustrators from 25 countries. We're the only UK university invited to the most important comics festival in the world at Angoulême. 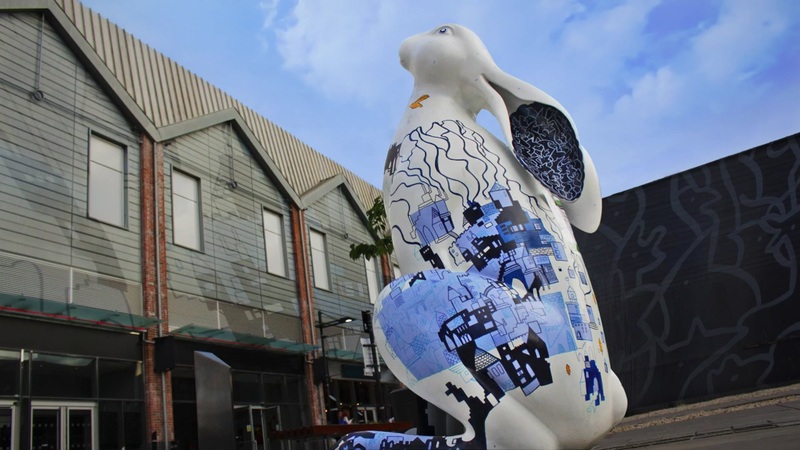 Discover diverse uses for your art - Carly's work is appearing as part of the Cotswold Hare Trail. A creative space to call your own. 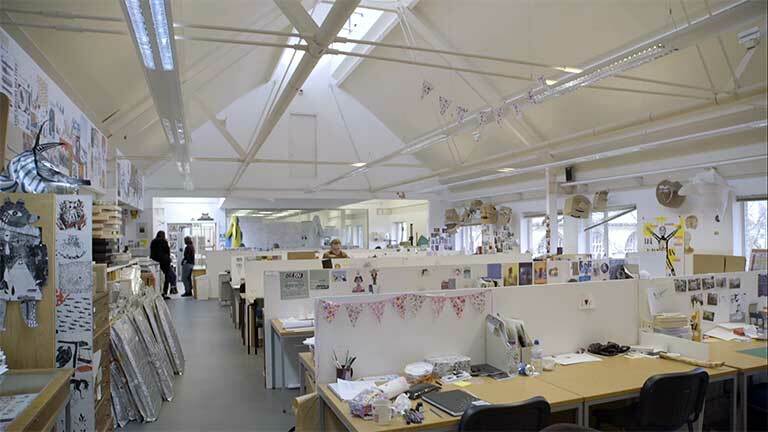 Our illustration facilities combine a modern studio equipped with an Apple Mac Suite with a traditional print room that includes a risograph stencil printer, letter press, silkscreen printer and book binding equipment. All our students are offered their own workspace in the studio that they can keep for the duration of their course. This helps to create a bustling, vibrant and collaborative environment that makes our course unlike any other. "I was born in Tokyo and grew up with the Manga and Anime cultures of the 1970s and 80s. I moved to the UK in 1991. After working as an animator with the likes of Duran Duran and Channel 4, I joined Redkite Animations and worked on a number of projects with DC Thompson. In 2008, I undertook a residency at La Cité Internationale de la Bande DessinÃ©e et de l'image in Angoulême, France. Since then I have chosen graphic novels and comic books as my main creative outlets and my current project is reflection on natural disasters in Japan, including the aftermath of 2011's tsunami. Teaching is a great passion of mine, especially supporting young talents to develop their own, unique artistic voices in various contexts, such as animation, graphic novels and children's books." Join Emily as she showcases her portfolio at the London Book Fair. A central element of the course is the application and testing of communicative drawing, as well as drawing with identified purpose and intent. An intense and productive process of enquiry and investigation, focusing on the acquisition of fluency, clarity and coherence in expressing visual narrative, will form your core practice. The techniques and technologies which form the practice-based mechanisms of illustration are also key, with the aim of achieving a dynamic, sophisticated and confident application of process. You will actively explore printmaking, digital painting, creative software and all forms of natural media. Drawing will also form a methodology for research and investigation, supported by lectures and workshops, and delivered by illustration staff who have a wide range of industry and publishing experience. You will be guided in intellectual and critical enquiry through practice, lectures and reflective study. The programme encourages enterprise and promotion alongside personal development. You will have opportunities to print, publish and disseminate your work in collaborative and personal publications for our imprint, ‘The Pittville Press,’ which is actively promoted at book fairs and publishing events. A series of intensive tutorials will direct you towards a creative portfolio strategy relevant to your personal aims. Get Illustration course updates and hear more about studying with us. Fill in the form below and we'll be in touch with Illustration updates, upcoming events and everything you need to know about university life.